At the end of the second term, the coaches of the academy take stock of the progress the students have made and then report that progress to parents. While we usually do this with report cards, this year coaches would also like to sit down with parents and talk to them about their child’s performance. For the convenience of parents, I have made an online sign-up to allow parents to expedite this process: Parent teacher interview sign up. Parent teacher interviews this year will be at Delta Manor Education Center, Wednesday March 8 from 4:30-8:00pm. Please sign-up ASAP as each time slot is determined on a first-come, first-serve basis. Thank you for your time and I hope to see you at the meeting. This past month, the academy has spent its time at Sports Central. A multifaceted facility in the heart of Richmond’s industrial district, Sports Central offers several weightlifting and field amenities that the academy had not yet accessed. It is a unique place that allows our juniors and seniors to make developments independent of one another while continually developing a team-oriented growth mindset. In every sense, Sports Central has been a real boon to the students of our academy. On the Junior’s side, Noah has become somewhat of a leader. He arrives every day prepared to excel in our game-based drills and commits to developing his game whenever he has a chance to put a stick in his hand. What’s more, on the weightlifting side of our facility, Noah has shown that he is capable of great focus and drive. Noah puts everything he has into the short time that he has with the weights and proves that he is worthy of this award every time he steps in the gym. Excellent job Noah. 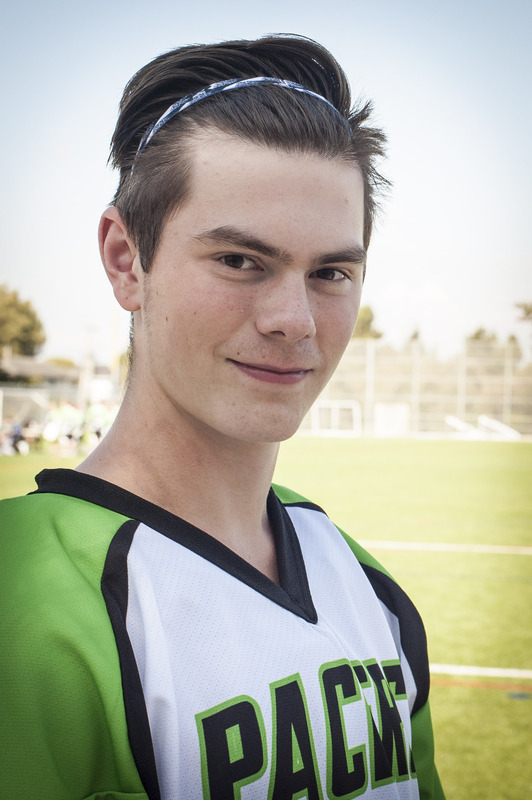 As one of our Premier senior students, Haiden has begun to elevate his game once again at Sports Central. 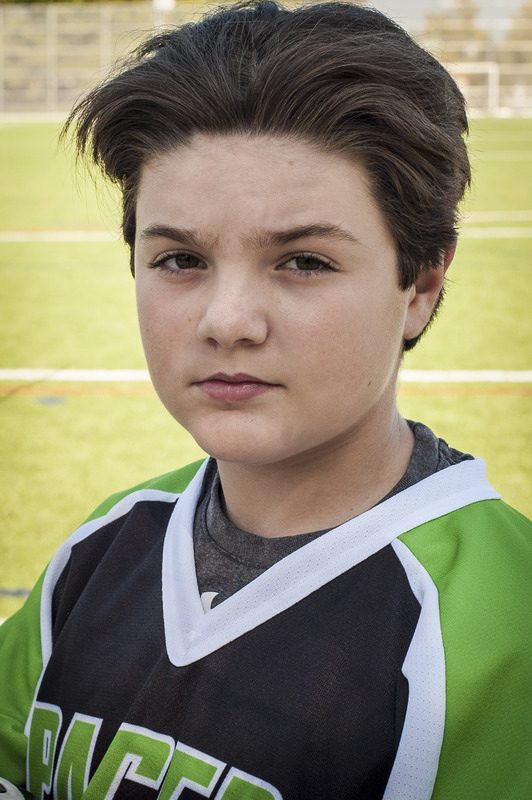 Haiden works at his weight training with the same intensity that brings him success on the Lacrosse floor. He is consistently driving himself to be stronger and more dynamic in his lifts and is relentless in his pursuit of becoming a stronger more powerful athlete. Haiden is also receiving this award because of his strong autonomy in the development of his skills. Haiden is the first person to pick up his stick every practice and is usually the last one to put it down. Repetition on repetition, Haiden works ceaselessly to make the most minuscule of developments in his fundamental skills. All in all, Haiden deserves this award because he has worked for it. In the gym and on the field, he has the type of work ethic that coaches want their players to emulate. Great work Haiden. That’s all for now, thank you as always for your support and for taking the time to read about our athletes. The past two months have been packed with a lot of lacrosse and as we head into the winter break, the coaches are pleased with the progress that the students have made. Our Senior team made an excellent showing at Claremont’s annual spartan shootout, with a record of 3-2 and our Junior team, without the benefit of the grade tens help, showed well against much bigger and more seasoned opponents. While the results spoke to the growth and development of our athletes, the coaches were not so much concerned with the result of the games, but with the performance, preparation and focus of the athletes that played them. Over the past two weeks the academy has been using the facilities at Delta Secondary to prepare for our training sessions at Sportcentral’s gym in January and February. In this time, we have begun to talk about sleep schedules, diet and physical preparation so that the students are ready to be unleashed on their lifting programs in January. In the months of November and December two students have become champions of focus and preparation. These students show up to academy practices and games each day ready, and I mean truly prepared in body, mind and intention, to game. Please congratulate our academy players of the month, Matthew Burt and Mitchell Sandberg. M att Burt shows his commitment to becoming a better athlete every single time he shows up to compete. What’s more, he competes every time he performs. Over the past month the coaches have seen Matt take on the role of “draw-man” in the midfield position and seen him continue to better himself in other positions around the field. But Matt is not just the type to get better on the field, he also commits to preparing for his athletics off the field. Matt is an attentive student and has shown through our classroom work a drive to be a better athlete through his preparation. Keep it up Matt. 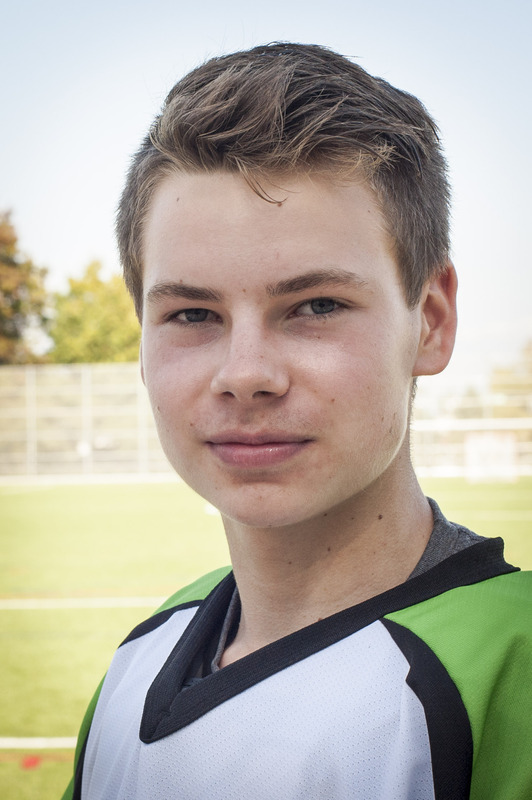 One of the premier players on the academy’s senior team, Mitch is the type of athlete that every coach wants to have on their team. He is prepared, focused and committed to becoming the best athlete that he can be. What’s more Mitch is in the business of trying to make others around him better. Mitch wants to win and he wants his team to want to win. He is committed to doing what it takes to win and he expects others to do the same. Mitch will be a leader when we lift in the gym next month and he will be a leader when we step on the field again in January for our first game. He has shown in his classroom work and in his work on the field that he will continue to grow and get better and he has also shown that he has what it takes to help his fellow teammates step up their game. Excellent job Mitch. Thanks to all the athletes who continue to compete, enjoy your holiday, and rest up for our training in the new year. Before we head into the weight room to train for box-lacrosse season, you should now be in a position to reflect on your progress from throughout the year. 1. In the academy so far, tell us what you have enjoyed about your development. Think about a part of your game and then write about how the academy has helped you to better understand/play your game. 2. In the academy so far, tell us what you have struggled with in your development. Think about a part of your game and then write about how the academy has pushed you to understand/play your game better. 3. What part of your physical stature would make your game better? Our game is a very physical one, what part of your fitness do you need to improve before the start of box lacrosse season next year? Consider your responses and submit before the end of class today. October has been a dreadful month in terms of weather. And with 28 out of 31 one days being as soggy as a trip to London-town, it is somewhat of a relief that it is over. To be sure, it has rained, it has poured and something tells us that, somewhere, the old man has snored. Despite the dreary reports from the weatherman though, our players braved the cold, grey days with the spirit of champions. As always at Dougald Morrison, we conquered the elements to bring the students a program from which they could learn all the necessary skills to be good lacrosse players. 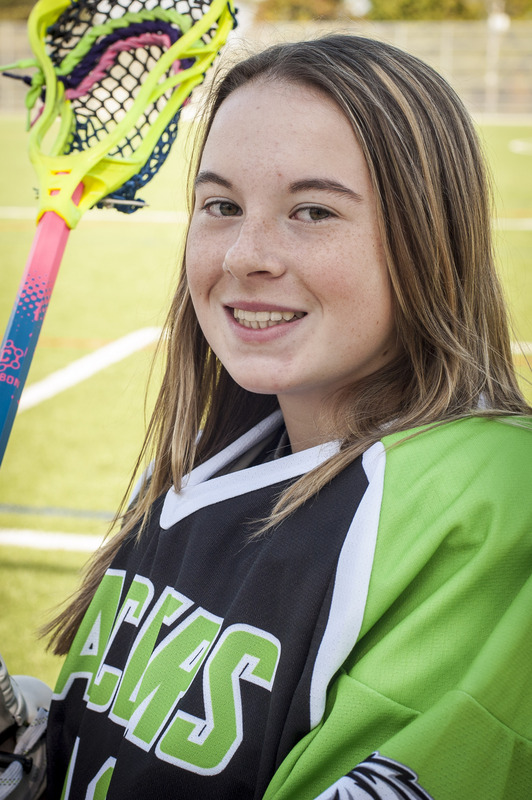 Anneke has continued her growth from last year becoming one of the junior squad’s premier midfielders. On the field she is one of the quickest and most sure-footed athletes on our junior squad. Never one to back down from a challenge, Anneke is one of the most tenacious defenders and loose ball women that steps on our field. Anneke also continually puts forth her best effort and, two years running, has been one of the academy’s players of the month. Great work Anneke, your peers are learning from your effort. Hailing all the way from Germany, this premier international athlete defines commitment to his craft. Anton always puts forth his best effort. He excels on the field and is focused in his preparation off the field. Perhaps more importantly though, Anton is as purposeful as an athlete can be. He shows up to practice with clear commitment to developing his game. 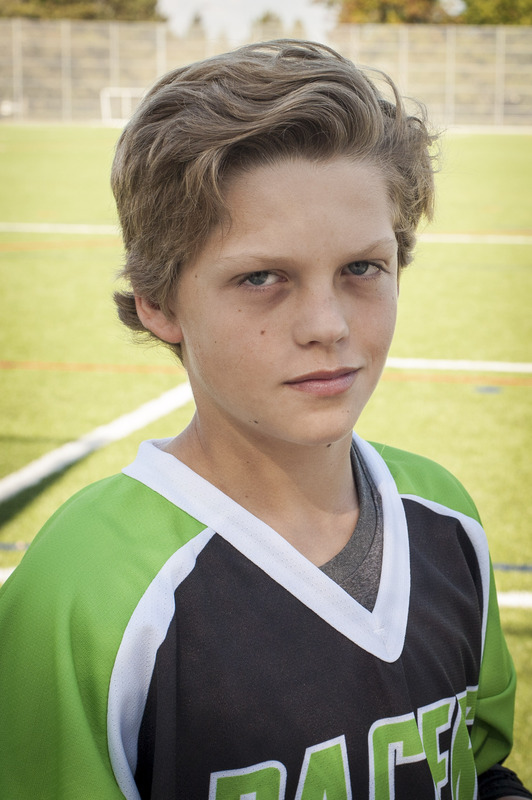 Anton gives maximum effort in the development of his skills and in development of his athletic skills. 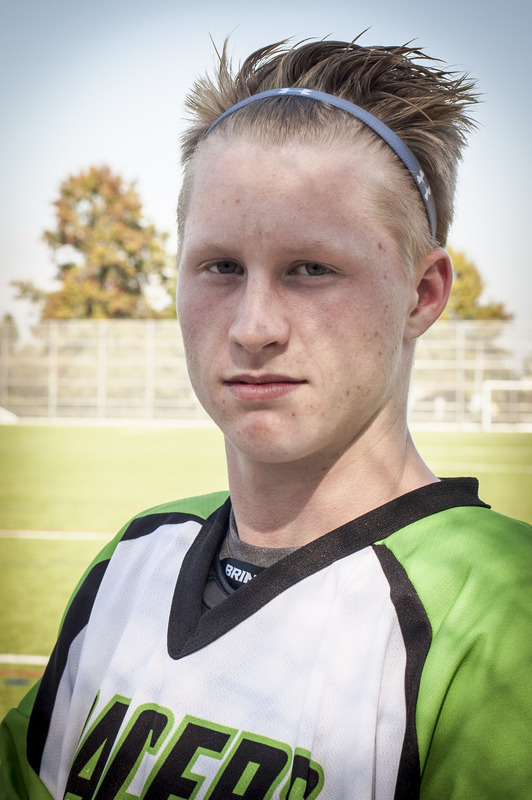 With athletes like Anton coming up in the Germanic Lacrosse system, Canadian athletes better be careful, else they fall in the world standings in future bouts. Well done Anton. That is all for this Month folks, please tune in next month for future athletic highlights. First, we are headed to the island for a play day on Nov 4. Please arrive at the Tsawwassen ferry terminal for 6:15am. Pick up from the same ferry terminal should run at 4:45pm, since we are returning on the 3:00pm boat. The students are responsible for their own lunch. Second, the schedule is out for Claremont’s Spartan Shootout. Please find it attached here: spartan-shootout-2016-and-schedule. Again, we will be taking the 7:00am ferry on Nov 25. Please arrive at the Tsawwassen ferry terminal for 6:15am. Pick up from the ferry terminal should be on Saturday Nov 26 at roughly 6:30pm, since we will take the 5pm boat. If you have any questions regarding either of these trips, do not hesitate to email me. Thank you all for your continued support. Over the past two months we have spent a tremendous amount of academy time working on categories one and two, but we have talked about number three very little. Now it is time to get our heads into what we do so we can start to do it better. In the following assignment, please reflect and think about the steps that you will take to develop your athleticism. What am I as an athlete and what am I willing to do to improve what I already am?